Emeritus Vineyards is a new project spearheaded by Brice Cutrer Jones, the previous owner of Sonoma-Cutrer. Jones is a passionate Pinot Noir lover who is known in the Russian River Valley for his unending devotion to charity work. He was one of the founders of the Hospices de Sonoma. About ten years ago he purchased 180 acres along Highway 116 just two miles north of Sebastopol. This was the culmination of a five year search for a cool, well-drained hillside property. Located on the Gold Ridge which runs from Sebastopol through the company’s vineyard and continues eight miles further north to Forestville, the ridge gives its name to the soils of the area which are sandy and well-drained. Some of the most prestigious Pinot Noirs in California are produced in this area. 120 acres are planted at Hallberg Ranch primarily to Pinot Noir, including Pommard and Dijon clones 115, 777, and 828. The vineyard is oriented toward the southwest on gentle slopes, giving the vines optimum exposure. The densely-planted vines are kept cool during the day by the gentle breezes that flow from the Pacific Ocean during the summer, and then cooled at night by the fog which appears almost daily in the early morning. Sustainable and dry farming is practiced under the direction of viticulturist Kirk Lokka to yield grapes that achieve full ripeness without excessive sugars and extracted flavors. Emeritus Vineyards also owns two small parcels in the true Sonoma coast near Annapolis at an elevation of 900 feet. Named the William Wesley Vineyard, this site offers a different flavor and texture expression of Pinot Noir than the home ranch vineyard. A Hallberg Ranch Vineyard Pinot Noir is also produced which is aimed at the restaurant business. 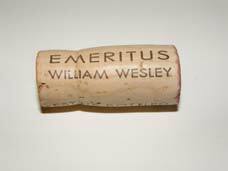 The William Wesley Vineyard bottling has been the primary wine sold to mailing list customers. The first winemaker was veteran Don Blackburn who passed away in 2009. His replacement was Nicholas Cantacuzene. In June 2017, it was announced the appointment of David Lattin as winemaker. Lattin brings 32 vintages of winemaking experience to his role at Emeritus, that includes a 15-year tenure as winemaker for Kuleto Estate. A tasting room on the Hallberg Ranch property is open with and without appointment daily. Check the website for hours. Tours of the vineyard and winery are available by appointment.